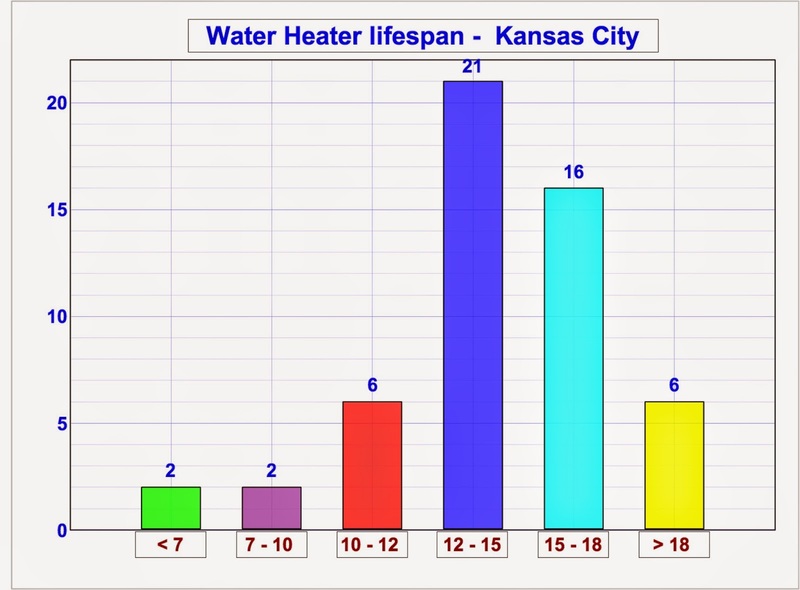 Recently KCTV 5 new ran a story that covered changes that will affect the way we heat our water. While the article did a good job of explaining the changes and how they would impact the average homeowner, the article did have some misleading information on one important detail. The news team chose to interview AB May to help gather information for the article. A company that just so happens to be one of the biggest advertisers of all the plumbing companies in Kansas City. At the end of the article they reported that the average life for a water heater was only 7 years. We went back and took inventory on the last 53 water heaters that were replaced over the last 3 months. This is a true representation of the average life of a water heater. 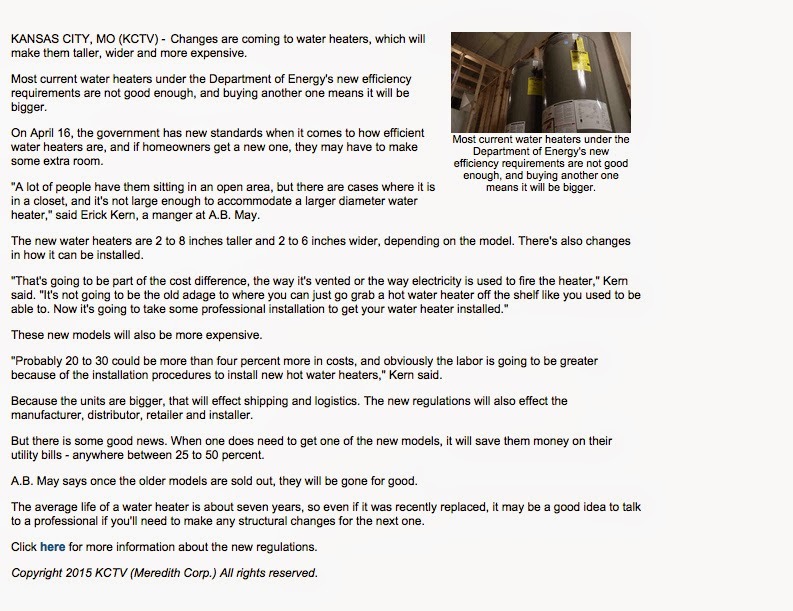 I can't imagine how many people after seeing this news story decided to replace a perfectly good water heater because of the misinformation provided by the news outlet. It's bad enough that the government is regulating water heaters and causing a significant price increase, the last thing we need is the media to convince homeowners to replace their tanks before they need to. Most residential and commercial water heaters have Anode Rods that are also referred to as sacrificial rods. 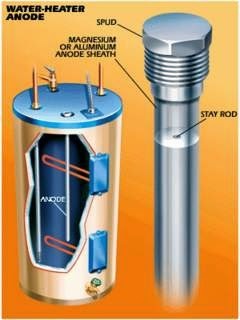 The anode rod is designed to help prolong the life of the water heater by attracting sediment to the rod instead of the outside of the tank. The most common types of anode rods used are made from either steel, aluminum, zinc, and magnesium. Most residential water heaters will use an aluminum anode rod for their standard tanks. An aluminum anode rod is of the least expensive options and will last longer than most other anode rods. The AO Smith GCV-50-300 residential water heater has an aluminum anode rod with a steel core to protect against corrosion. The GCV has a 6 year warranty and is one of the most common water heaters installed by plumbing professionals. The same water heater is available in a 10 year warranty, the only difference in the tank is the anode rod used magnesium instead of aluminum. This is a bit surprising due to the fact the magnesium actually breaks down faster than aluminum. Without an anode rod the tank will rust out sooner. If aluminum was consumed you would experience arthritis like symptoms and could upset your stomach. A magnesium anode rod is slightly more expensive than other materials but can actually offer health benefits if consumed in drinking water. The downside to magnesium anode rods is that they dissolve much faster than other materials and may need to be replaced after 6 years. Zinc anode rods are often mixed with aluminum or steel and are not as common today as in the past. The zinc can react with different metals to promote growth of bacteria. Many people that report a sour smell from their hot water have a zinc anode rod to blame. The anode rod can be replaced which should resolve the problem. A traditional salt water softener can break down an anode rod much faster than the normal rate. It is recommended that homes with a water softener replace the anode rod every 3 years to help protect the tank from corrosion. The actual risk of using an aluminum anode rod is debatable. Wikipedia stats that under normal circumstances Aluminum is not water soluble and is well tolerated by both plants and animals. You should also consider that most of the time you will not drink from the hot water supply lines unless you have a circulating pump and a bad faucet cartridge that allows hot water to mix in with the cold. If you are considering adding a second water heater you will need to be sure your flue is large enough to support additional BTUs. 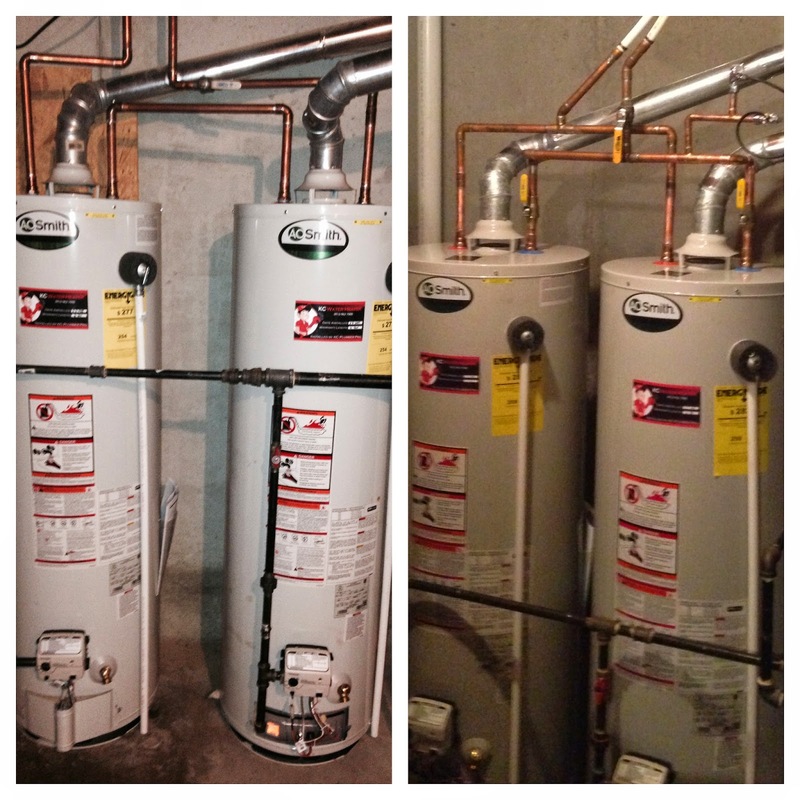 Here is an example of a home in which the homeowner wanted to add a second water heater to help fill up a large tub. The water heater flue was a 5" Type B double wall pipe serving two appliances with a total distance of 30'. 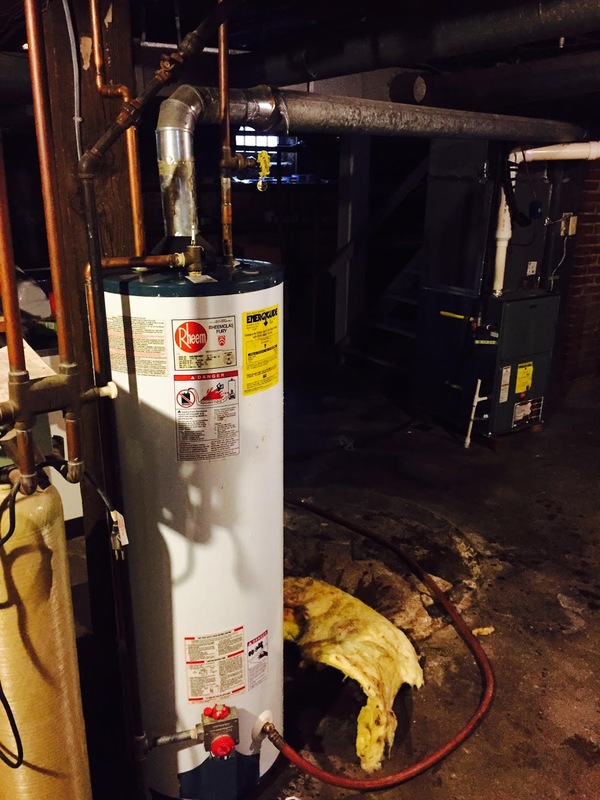 The first step in determining if a flue is large enough to support an additional water heater is to add up the BTUs for the existing water heater and furnace. This home had a furnace that was sized at 150,000 BTU and a water heater that was 40,000 BTU for a total of 190,000 BTU. The maximum BTUs allowed for this situation was 193,000 BTU so we were able to determine that adding a second water heater would not be safe. If this house had a 6" flue the maximum BTU would have been 300 BTU. 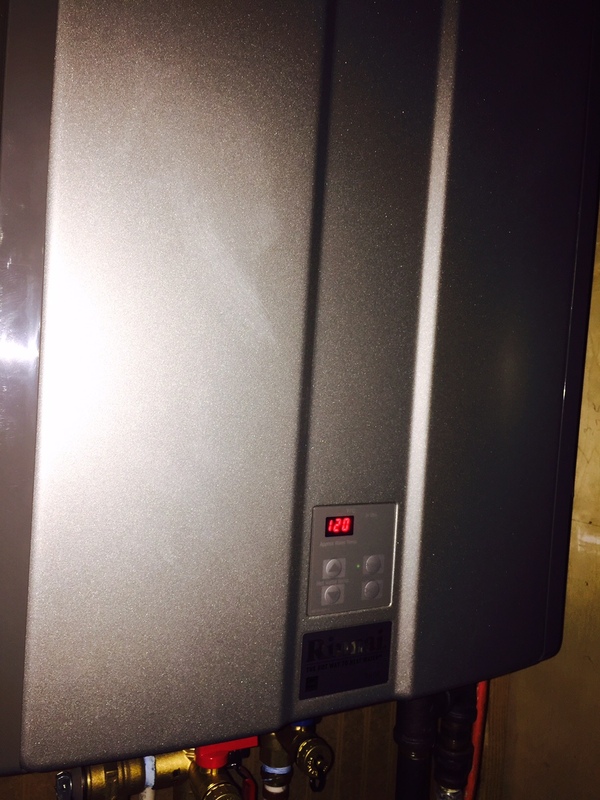 In most cases you will be using a single wall connector to connect the second water heater. In most cases a 4' Y is required when combining the second water heater. If you currently have a 5x3 Y off your main flue you will most likely need to replace the boot with a 5x4 Y. When installing a second water heater you can setup it up in one of two basic methods. The first method is shown in this picture is referred to as Parallel. In a parallel piping system both water heaters work independently to heat there share of the water. A Series piping method is setup for the water to be heated in the first unit and then pumped into the second unit. The series installation is a little easier to install and has a few other advantages. 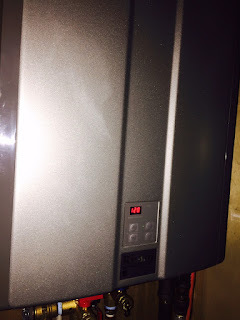 The main reason we like to install a second water heater in Series and so that you can turn the first unit down to a low temperature to preheat the water. This will still give you an increased supply of hot water but will run more efficiently than two water heaters both running at operating temperature.